Store your happy memory with your family, or of traveling etc. Organize or place whatever notes, papers or reminders that are important to you. Share or show your experiences or art works with friends or visitors. 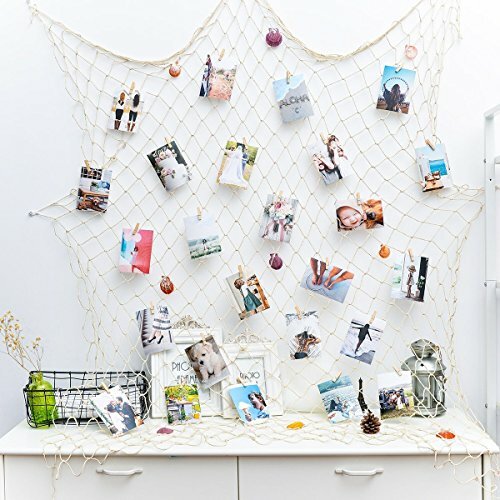 Wonderful Decoration - An artistic way to display your instagram photos, Christmas cards, stockings, mementos, making them a wall decor essential for your living room, bedroom and dorm room. Flexiable and Versatile- Change your photos whenever you want, and also suitable for arts work or crafts, other papers or cards etc. Very lovely - You can use with some bright color of starfish,conch and other items,it will bring you more better effect. If you have any questions about this product by CoolDi, contact us by completing and submitting the form below. If you are looking for a specif part number, please include it with your message.